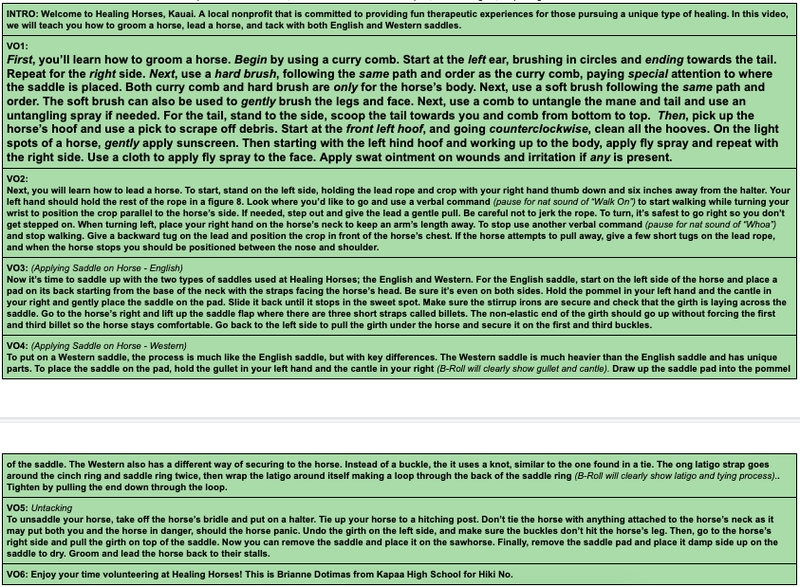 My group's story topic is on Healing Horses Kauai and we intend to communicate more tutorials for aspiring volunteers. What viewers of our video will learn from watching it is learning on how to properly groom a horse, safely lead a horse, and finally how to saddle a horse. If they care about animals, volunteering, and horses hopefully a viewer can take any information from our how to videos. From our rough cut our group will improve on camera movement, audio / sound mixing, and some of our shot composition. How my group can improve on audio / sound mixing is we can make sure that our nat sounds and voice overs both sound natural, loud, and clear. As for improving on camera movement we will make sure that our shots perform to the standard of Hiki No and look as high quality as possible. The purpose of the Digital Millennium Copyright Act (DMCA) is a law that criminalizes production and dissemination of technology, devices, or services that intend to circumvent measures that control access to copyrighted works. Copyright infringement is when somebody infringes on a copyrighted work without permission. Some legal consequences of using a copyrighted material without permission can be a payment from $200 to $150,000 for the loss of profit, attorney fees and court costs all by the infringer. You can get permission to use copyrighter materials by asking the original creator / creators if you can use that work. Fair use is a limited use of copyrighted material without having to acquire permission by the copyrighted holder. Some examples of fair use that are normally used everyday are commentary, parody, news / reporting and research. Always credit the owner / copyright holder when using copyrighted materials! It is essential to gain permission to film on location because the cons of filming without permission outnumber the cons of not being able to film on that location. If you don't get permission and film on a location what might happen is your reputation will probably go down and you'll probably be charged if you film on private property; You always need permission to film on private property. Release forms are forms that allow a third party to use the appearance and voice for an individual benefit. Release forms are for a filmmaker to have legal permission to distribute and sell you in a picture / video. 1) Embed your finished story from Google Drive at the top. 2) Insert a photo bar of 3 behind the scenes photos after the 1st paragraph. 4) Add an image of your critique results after the final paragraph. ALD 3.1 Evaluate the relationship between digital technology and criminal activity for its affect on the digital marketplace. ALD 3.2 Evaluate legal and ethical behavior related to the creation, use, and distribution of digital content that minimizes the risk of legal or moral consequence. How to choose an interviewee can be an easy or hard start depending on the person you have found. If the person that you plan to interview has had a life changing experience or a unique lifestyle then it can be easy. If the person that you plan to interview has little to no unique experiences then it can be difficult. How to select the topic for the interview is manly involved with the person that you're interviewing since the person in my group Brianne has a passion for being a Musician our first interviewee was easy. My group's roles were pretty organized and we stayed on track during most of the project. Lester was the Director, Voiceover, and Editor for the production. Kainalu was the Reporter for the production. I was the Audio and Script Writer for the production. These jobs that were assigned helped us because we knew the outcome and what each person needed to do. Safety is the number one priority during the production process. The first Safety concern that your entire team should be aware of during the production process is to know the surrounding; some general ways that a person can know their surroundings is pay attention to the area and don't use the camera while you're on the move. The second Safety concern is to be smart while filming; use common sense to understand what your filming. The final Safety Concern that your entire team should be aware of the people all around you; if the person that you are filming tries to do stunts for a video and he/she isn't an expert really think if it's a wise idea to record that. Your entire team should know these three Safety concerns because having your team know these will lead to a much more prepared and safe team. 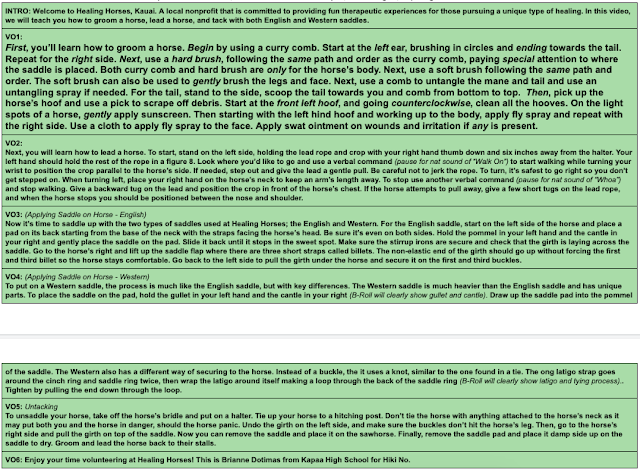 Our critique results show an 3 / 4 it needs more work even though it looks alright. 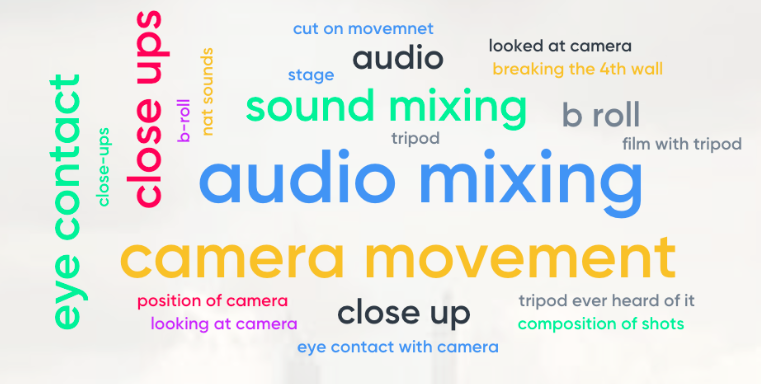 Our three largest words for improvement include Audio Mixing, Camera Movement, and Eye Contact. The biggest word of those three, Audio Mixing we had great nat sounds but we didn't emphasize them as much as we could've. ALD 6.1: Anticipate potential health and wellness concerns while operating computing devices in order to enhance workplace safety. 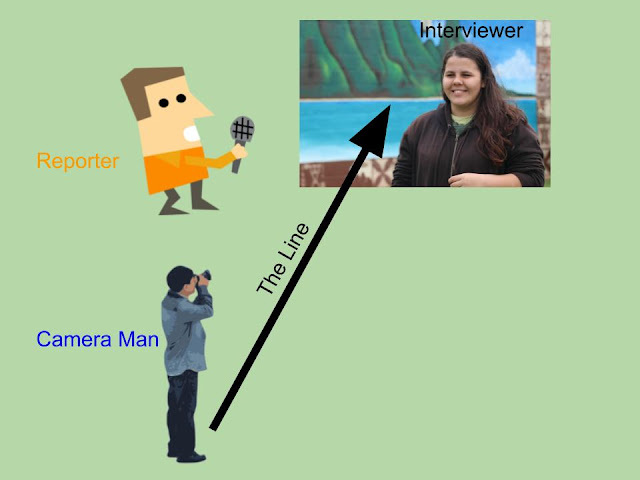 A Host / Reporter shot is a type of camera shot that the person in it is usually in the center, looking at the camera, and is directly informing the audience. A Interview shot is a shot in which the person in it is along the side of the shot and not looking in the camera but more along the side of the camera. In an interview the background should be composed of multiple surfaces because the background is the most important detail in an interview. In an interview shot the background should NEVER be flat because it will look pretty bland and the point of an interview shot is to shoot someone at their best. The "Look Room" is the proper field of view room of a person. "The Line" is the field of the camera. If someone passes the line, they pass the view of the camera. The most important parts of shooting a successful interview is to make the interview feel natural and normal. If the person being interviewed doesn't feel normal the interview will be very hard for the everyone. The director must let everyone feel natural so it doesn't compromise the interview. A director can ask questions to ease the person being interviewed or the production crew. A strategy to make the interviewing process easier could go into these steps. The steps are scout for a great location, set up the camera and then see if the location works, if it does get the best shot / shots that you possibly can for the interview. Always keep checking and get a lot of shots you never know if something could go unexpectedly. This pre-test Interview Shot is almost perfect except the poles and class background aren't linear to the ground and the picture is blurry. This pre-test Interview Shot's background is flat, the subject should've been farther from the wall. This pre-test Interview Shot is perfect but the background has too much going on. All footage and tutorials used in these Editing Practice videos provided by Hawaii Creative Media. Editing techniques create elements that add to a story by showing visual transitions that sometimes are unnoticeable to the eye. Some cuts such as Cut On Movement, Graphic Match Cut, and Transition Cut are intended as smooth cuts. While cuts such as a Jump Cut are sometimes intended for a noticeable cut. A filmmaker could build conflict, suspense, anticipation, or anxiety by using a specific editing technique. By using Cut On Movement a filmmaker could build physical conflict and using Graphic Match a filmmaker could build anticipation. The role of natural sounds, audio soundscape, and music for a filmmaker is to advance a story as a helpful and sometimes powerful tool. The impact that a powerful PSA could have on an audience would be something that can change people's view on a certain topic. I believe that a PSA could persuade someone's acts or thoughts at least to a point where they see more options. What I am hoping to accomplish by producing my PSA is a public service announcement that at least opens the viewers eyes to new options in their life. Our PSA is about "Eating Local" and our audience should care it can lead to a healthy and better life. Eating fresh foods such as fruits and vegetables will improve a persons diet compared to processed foods. Also in my opinion just eating healthy foods compared to greasy, processed, and junky food just feel better. What "Eat Local, Eat Fresh!" is it's a Youth Exchange that's sponsored by State of Hawaii DOH Chronic Disease Prevention and Health Promotion Division. 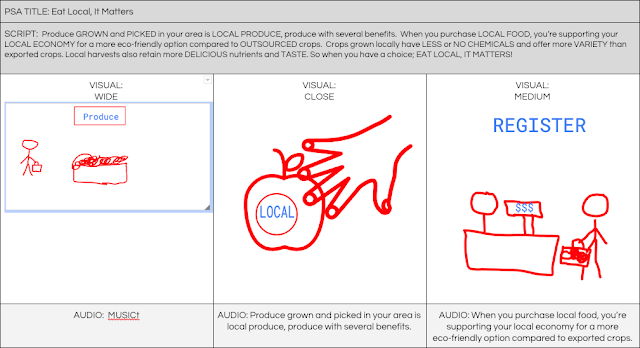 An important rule for the PSA contest is explain local / healthy foods and show how they taste better. Another important rule for the PSA contest is we should to involve our local community. Finally the last and probably one of the most important rules for the PSA contest is the PSA video must be 30 seconds; not any longer, not any less. There are so many opportunities for Media students with the PSA project because it lets the student start somewhere that will helps them grow and it helps their community. I personally think that from a PSA everybody benefits. It's free work for the ones running the contest, an impressive start for the students participating, and finally it also benefits the audience by alerting them about an issue. How the PSA evolved, changed, and improved throughout to our final cut is actually pretty interesting. The rough cut isn't as cleaned up as to the final cut. The final cut's voice over is more natural. Our natural sounds such as vegetables cooking and wind throughout the background are recovered. We added keyframes to our final cut to make it much more refined for the sounds. Finally we used our best clips to the final cut so it looks much more natural, cinematic, and fresh. All of this was added because our rough cut did not have these aspects and our team thought that it would make it much better. The critique results for my Final Cut shows how much effort that my team did. 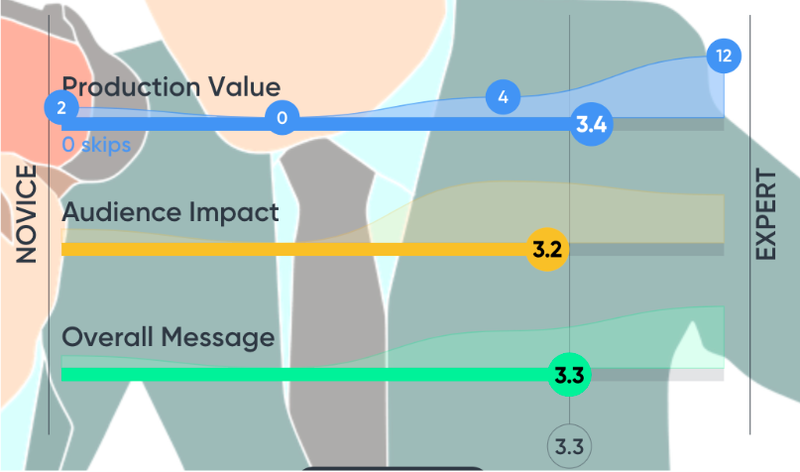 I agree with the Audience Impact and the Overall Message that it's around a 3 - 3.3, however for the Production Value I feel that it should be a 3.5 - 4 because we do show multiple locations. I appreciate all the compliments that were given; I feel the best compliment was one that talks about the quality and the portray of the message. In conclusion I enjoyed this Public Service Announcement project and I feel that I have learned a lot of high quality video production. A Cinemagraph is a type of looping video with still background / still surrounding; it's similar to a gif but it has a start and end. The basic process / steps of creating a cinemagraph is record the video, put it in your editing software like FCPX, add the mask, and finally edit the mask so it works with your video. Some strengths of our cinemagraph is the tripod that we used to film was very stable. But areas for improvement that we could've fixed was the subject's foot was almost cut off and the lighting was kinda reflecting off the globe. My plan for accomplishing my second Cinemagraph is about a CD spinning in a CD player with my finger over the disc. My plan for setting up the setting will be a close to close medium shot upon the CD player. The subject is technically both my finger and the spinning CD. As for my lighting I hope that it works out great because it's a light subject and with a dark background. My second Cinemagraph turned out really good! Everything I did was expected and looks similar to what I was thinking for my final. I could've improved the lighting, and the frame's feathering. I could improve upon those things for my third attempt. What I plan to accomplish for my third / Final Cinemagraph is: my friend in the background with the wind blowing the grass. The setting is the courtyard of Kapaa High. The Nonmoving subject is my friend and the moving one is the grass. Really the equipment that I used is my phone to record the subject. My third and final Cinemagraph turned out pretty good, I like how the weather helped out this cinemagraph because the wind totally makes this cinemagraph work. Everything that I stated in my second paragraph about my anticipation for this cinemagraph turned out great. The purpose of creating a Cinemagraph is to make a still still image with some moving aspects. What a cinemagraph can do that photos and videos cannot is let the viewer see what he / she should see in an easier and faster style. Cinemagraphs load faster compared to videos and unlike videos you don't have to click on them to play them. Cinemagraphs can also share more information compared to a photo. I very much agree with the critique results; however I personally feel that my second Cinemagraph is my best out of all of them. On my third Cinemagraph the loop of the grass is a little long compared to the loop of the cd player. 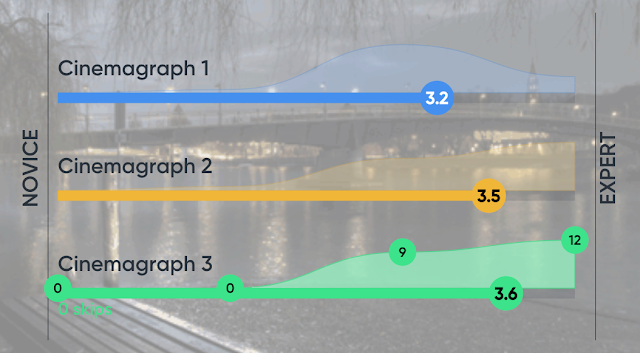 I would've given myself a 3 for my third cinemagraph instead of a score that's mostly a 4. As for my second cinemagraph the camera is still, it's creative, and it's in a loop. So a 3 or 3.5 is pretty accurate. I really enjoyed this project and I had a lot of fun learning about and making cinemagraphs.